Born on April 10, 1920 in New York City, he was the son of the late Cyril and Catherine (Mitz) Supranovich. William lived in Meriden for most of his life and also lived in Yalesville where he raised his family. He graduated from Meriden High School, Class of 1937, and attended Meriden Trade School. 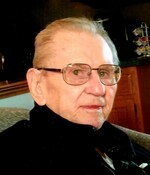 He was a veteran of World War II, having served with the U.S. Army. He was employed by New Departure as a machinist retiring in 1985 and was a parishioner of St. Stanislaus Church. William was an avid fishermen and hunter. He was a member of the New Departure Fish and Game Club, past member of the Wallingford Fish and Game Club for many years. He took great pride in restoring old cars with his late son Billy. He was an outstanding father to his step-children who considered him a father. William is survived by his three daughters: Sandra O’Brien and her husband Barry, Donna McMillan and her husband George, and Nancy Post and her husband John, one son Thaddeus Oblon and his wife Diane, nine grandchildren; Jennifer Sanders (Trip), Michelle Brino (Claudio), Barry O’Brien Jr. (Anna), Michael Oblon (Renee Mammone), Ryan Post (Rachel), Jackie Kankainen (Erik), Melissa Oblon, Michael McMillan and Mark McMillan and twelve great grandchildren who were the love of his life. He is also survived by a sister Stella Sharron. He was predeceased by his son William J. Supranovich Jr. and his brother Alexander Supranovich.